Recently at the hospital where I work, they changed our cardiac monitoring system to a different system from a different company. The switchover happened on Tuesday, and since I had volunteered to be a “super-user” and received additional training and education about the product, I was there to help them set it up. 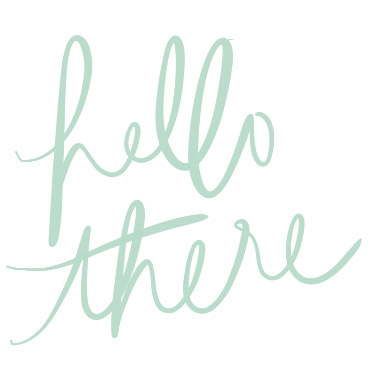 However, like with any change, a lotttttt of issues happened and it was a stressful and frustrating day for everyone. One of the new things about this system is that it has different, louder alarms than our previous system. The “crisis” alarm, which goes off when a patient has an extremely slow or fast heart rate or has a lethal arrhythmia, sounds like a fire alarm. And thankfully for us (heavy sarcasm here) we had a patient who alarmed V-tach frequently. So on top of the frustration of installing a system that wasn’t working, and having twice as many bodies on the unit, we also had an anxiety-inducing alarm ringing frequently. I happened to bring these truffles on this day to contribute to a potluck for one of my co-worker’s last day of work, and thank goodness I did!! They turned out to be the PERFECT little treat for a stressful day. 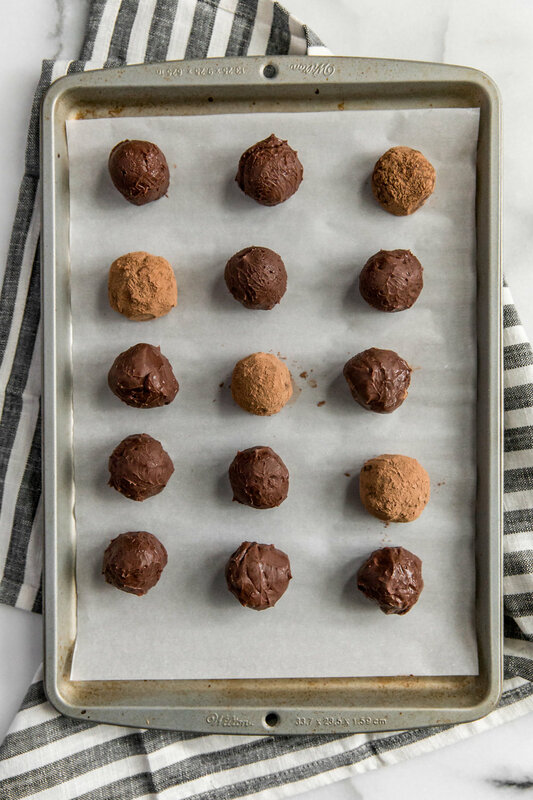 The truffles are rich (seriously, you only need one to feel satisfied), truly so easy to make, and only have a handful of ingredients. You start by making a ganache (which is just a fancy way of saying melted chocolate and cream). Once the ganache has solidified after refrigeration you will scoop out the truffles. Next, coat the truffles with your desired coating, whether that be cocoa powder or chopped nuts. And that's it! The truffles can become soft at room air, so I like to store them in the freezer to help keep their shape. 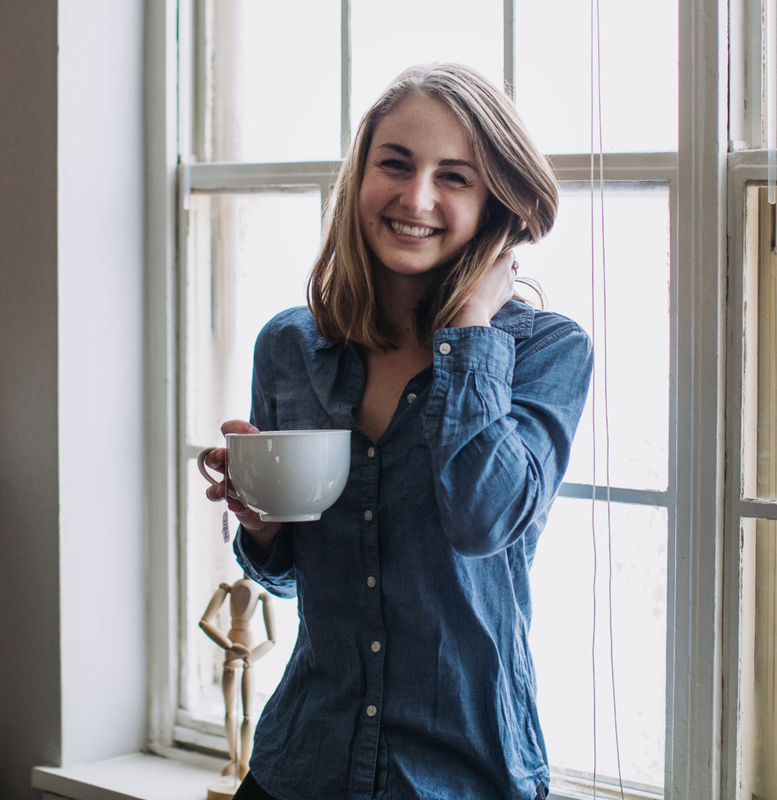 But don’t worry, you can still eat them straight out of the freezer without any harm to your teeth as the ganache consistency prevents them from turning into a solid block! 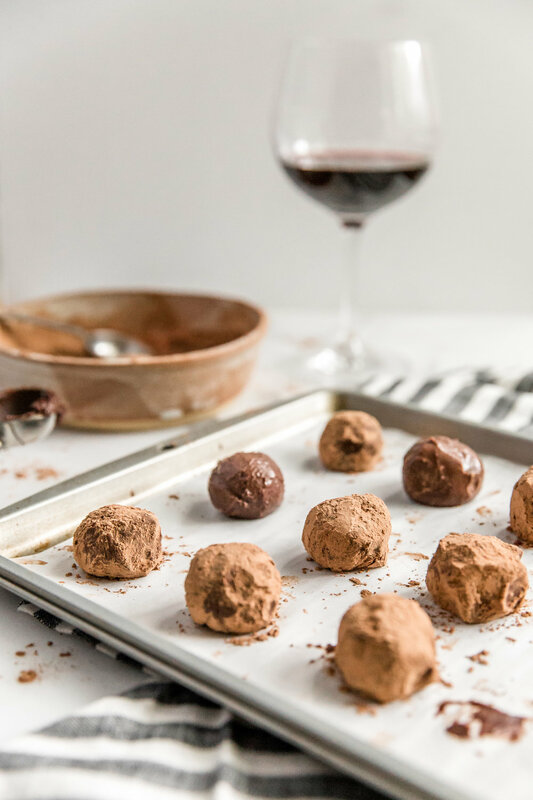 These truffles would be perfect for so many occasions - a romantic date night, a girls’ night, as a housewarming gift, as a gift for your chocolate-loving friend, or in my case, a way to relieve stress! Place the chocolate in a heat-proof, medium bowl. In a small saucepan, heat the milk and butter, stirring occasionally, until the mixture boils. Pour over the chocolate, and let sit for 1 minute. Use a spatula to stir the chocolate until completely melted and smooth. Add the wine and vanilla, and whisk until smooth. Cover with plastic wrap, and refrigerate for 2 hours. Line a baking sheet with parchment paper, set aside. Depending on which coating you want for the truffles, either place cocoa powder or chopped pecans in a small bowl. This will be your coating bowl. Remove the truffle mixture from the refrigerator. Lightly coat the palms of your hands with cocoa powder. (This will reduce the amount of sticking to your hands). Using a small cookie scoop, scoop out the truffles. 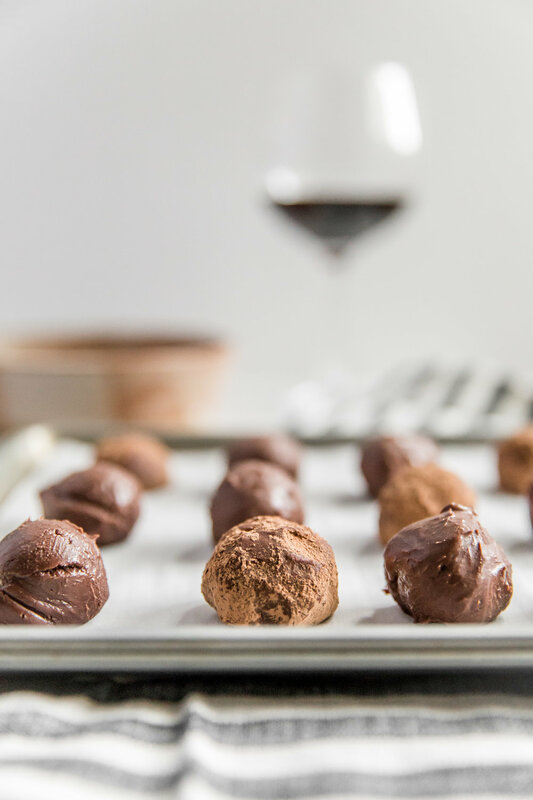 Briefly roll each truffle in your hands before transferring to your coating bowl. Work quickly as the truffles will start to melt in your hands. Coat the truffles completely, then transfer to the pre-lined baking sheet. 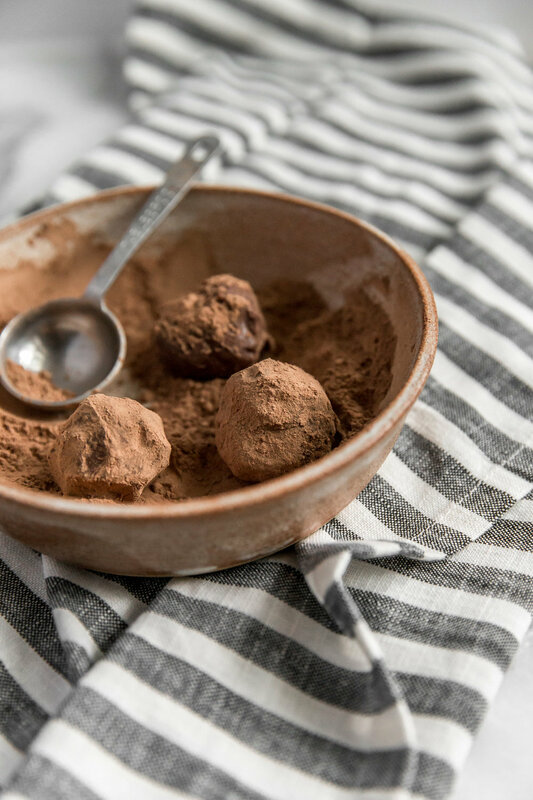 Transfer the truffles to the freezer for at least 20 minutes before eating. Store truffles in the freezer as this will allow them to keep their form the best.